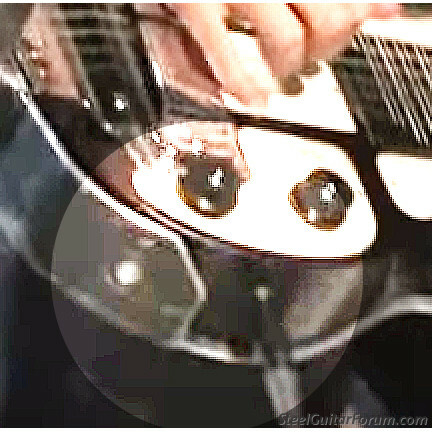 Has anyone figured out her design on the Rickenbacker lap steel metal belly brace for standup playing.?? Looks like the Ric is cradled on 3 sides. I would like to build or buy one. Here is a picture of one. Not sure it is hers? Doesn't look too difficult to make. I know there is a ledge the Ric rests on beneath the picture. I wonder if the brace is made out of sheet steel or aluminum ? 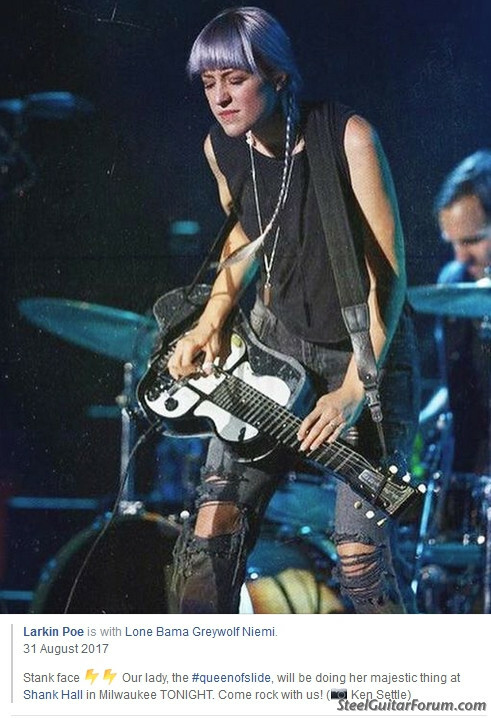 On the pictures posted it looks like the Ric just slides into the metal brace and the shoulder strap holds the guitar into the belly brace. I assume there is some foam padding protecting the Rickenbacher. Any pointers from others that have made there own if ya had to do all over again?? Do you think styrofoam like used in insullation would work? It could be traced, bandsawed, sanded, covered, then attached with a couple of small pieces of double face tape. It would also be very light weight. Bill, I don't think it would stand up to any kind of stage use. Megan's metal one looks pretty tattered. 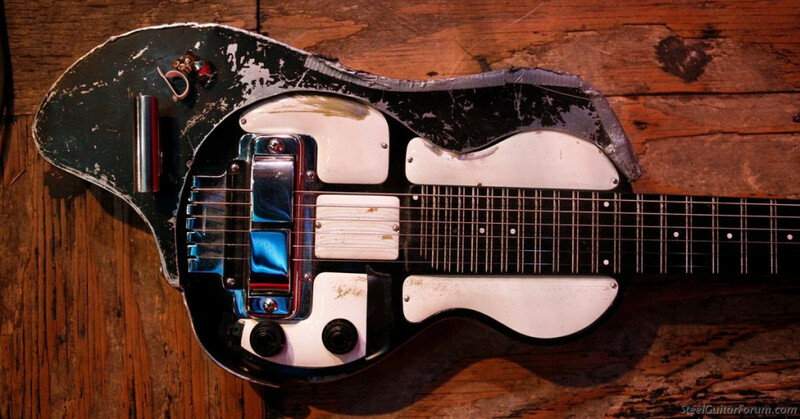 I used a Fiberglas shell that was guitar shaped. It attached to the back of the steel with two thumbscrews (needed to drill 2 holes for threaded inserts - you probably don’t want to do that with an old Ric). The shell was filled with styrofoam to cushion the steel. Ted Smith of Melobar made it. I played out with it for several years, until the Fiberglas around the end pin started cracking. That’s when I had my blue steel built.. It appears that "Panda" that's what she calls that Ric has a steel or aluminum frame that cradles the Ric. Any bolts would be the strap button and one "stud" *hard to tell* right where the wrap around ends by the tone knob just before the cable jack. Note the metal cradle under the lower bout of the guitar following the shape of the Ric as a mold. NASA close up There might be other "studs" elsewhere on the other side on the upper bout holding the Ric in the cradle. The use of duct tape along the edge that presses up against the waist might be something to keep the guitar from sliding off the clothes material as she dances around. If she uses this cradle during recording, bet it augments the tone she gets for the added mass. That black bar behind her to her right is a short boom stand she happened to be standing in front of during this image. This is off topic, but do any of you know what tuning she uses on her Ric? I’m pretty sure she uses standard Dobro G tuning. I made contact once, thinking facebook. I was told she uses a tube screamer also. I really dig what Larkin Poe are doing, sounds pretty areal and groove-in to me. Megan used to use a 65 Fender Deluxe amp and she is definitely using a High G tuning like the Dobro guys do. She started with Jerry Douglas for inspiration at first on Dobro and moved on to Duane Allman, Derick Trucks and David Lindley for inspiration when she started doing the lap steel. I didn't realize you'd could get such a great distorted blues sound with a High G tuning. I know she said a family friend had a steel company and she drew out a template for him to fabricate her lap steel add on. It looks like it is indeed made out of aluminum, which would make sense. I wonder if the add on is screwed into the Bakelite?